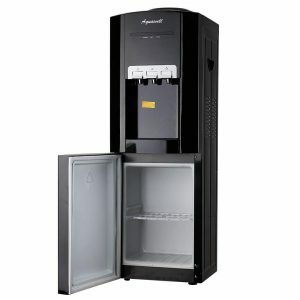 AquaWell WD-002 by HomeLeader is a commercial grade, stainless steel, freestanding, top loading, hot and cold water cooler dispenser with a sleek and modern design. It is offered in elegant silver or you can alternatively purchase the WD-004 model in black, that is 16 dollars cheaper at the moment. Both can be used in offices, waiting rooms, homes, restaurants, hotels and in other settings that you want to use. As a brand new 2018 release product there aren’t a lot of customer reviews online yet but the ones we read through were rather positive. With an advanced compressor you’ll get cold water much quicker and colder than on other models- roughly 9°F less than average. 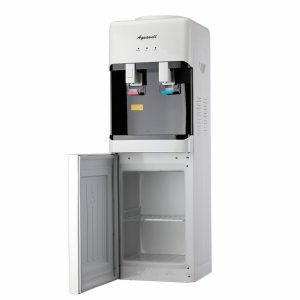 You can expect cool and pure water with great taste thanks to the cold water reservoir and the stainless steel body. They have the food-grade stainless steel hot and cold water reservoirs. You can use the standard 3 or 5 gallon water bottles on these top loading type water dispensers. They are easy to set up and it should not take you more than a few minutes to get cold water after plugging them in. The modern compressor runs- does its cycles very efficiently and quietly, with the lowest cycle rate around. You’ll hardly hear anything except for a light humming when it is doing the cycles and you will not be disturbed, whatever you’re doing at home or office. You’ll find three indicator lights just above the two water outlets for hot and cold water (three outlets on the WD-004 model) on this dispenser. There is a child security lock on the hot water spout. Or you can alternatively turn off the hot water button at the rear. The AquaWell Water Dispensers are both easy and safe to use. They hold the FDA approval and ETL certification for health and safety. And the warranty offered is one year by the manufacturer- HomeLeader and friendly customer support that responds to your queries within 24 hours. There is a removable drip tray where you can put your cups or glasses just below the water outlets. And they will catch any spills or drips and will help prevent any mess. You can disassemble the water box easily for cleaning purposes on both models. The minimum water temperature you’ll get on the WD-002 model is 5°C (range of 5℃ and 10°C) and 10°C (range of 10°C and 15°C) on the WD-004 version. 95℃ is the maximum hot water temperature on both water cooler models. You will not need to use a kettle or stovetop to boil water anymore. You can get room temperature water by simply switching off the independent power buttons at the rear. This also means they will dispense water when there is no power. Hot water is hot enough to make coffee, tea, or hot chocolate, whichever version you choose. Water tastes pure and clean at all times, without any weird after taste.The stainless steel Aquawell WD-002 weighs 16.5 pounds and measures 36.5 x 35.5 x 101 inches. The AquaWell WD-004 has the same dimensions as the WD-002. The cooling power is 70 watts, the heating power is 500 watts and the voltage is 110V/60Hz- suitable for use in the US and Canada. And they both appear to be very good value for money overall.